The kitchen is a very important part of the residential dwelling. The most important food preparations to keep us up and high are done in the kitchen. There comes a point in time when you start to feel about remodeling your kitchen. There can be many reasons behind such feelings and now we will be discussing the most important reasons which suggest that it’s time to call the experts like kitchen master design services to take the command and give your kitchen a completely new and organized look to satisfy your needs. The major reason behind the remodeling is the change in lifestyle and it is all about your living habits. 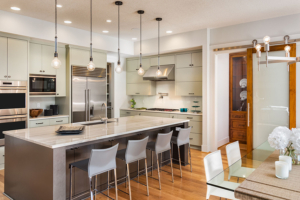 The very first reason which leads to the demand for renovating or redesigning your kitchen is when you start to feel lack of space in the kitchen. Less space on the kitchen slabs and counters to keep all the necessary items is really worrisome. If you are two people who work together in the kitchen, then it becomes very tough to work in the cooking area due to congested space. The counter area must be designed to give you enough space and this is one of the most common reasons behind kitchen remodeling in Virginia. If you are having children at home and you are not able to look after them because you spend most of your time in the kitchen. Then it is the time to upgrade your kitchen with the latest equipment for cooking. Using an induction can be a great option for quick cooking and a dishwasher can be highly beneficial to you if you are looking for higher efficiency in your kitchen. If you feel there is a requirement for a bigger room in the kitchen for completing your kitchen work in a better way then you must go for remodeling the kitchen. If your kitchen lacks in organization, you can go for more defined sections in the kitchen which can keep your important routine items such as tea, coffee, utensils, spices etc. moreover, some extra slabs can be provided in your cooking area to give easy access to the products which you require for cooking purpose. Some additional reasons behind remodeling are giving your kitchen a completely new look due to changing trends. However, you can choose from multiple kitchen designs depending upon your living style, it can be a classy kitchen which is well equipped or it can be a customized kitchen which can get your needs fulfilled. There are always choices between giving an evergreen look to your kitchen with good equipment or giving it a different touch which separates it from normal kitchens. All these things depend on your financial status and desire to invest. Once you feel that you need a new and advanced kitchen and you are having a good financial condition to invest then you can give a try to kitchen remodeling with the most expert professional services hired. 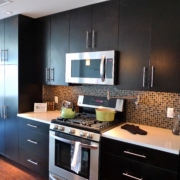 If you are considering kitchen and bath remodeling in Bethesda MD, there is a chance you are in for the shock of your life. If you think that finding a reliable and highly recommended kitchen design Clarksburg Company is easy, think again. We all know how it goes when we are looking for the right kitchen or bathroom design Maryland firm. We find ourselves in the middle of the store and trying with all our might to sort through the endless collections of designs and samples. We get stuck at the local hardware shops and then the inevitable happens; confusion takes over! And as it grows and becomes bigger than we imagined, we find a little solace in the materials, designs, textures, colors, and surfaces around us. They give us some idea as to what we would want our kitchens or bathrooms to look like. 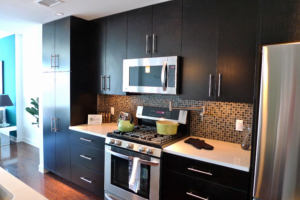 Kitchen and bath remodeling doesn’t have to be like that at all. You need to understand that you are doing this to make your life easier and not to complicate it further. Therefore, if you want to make sure that the designs and textures you’ve chosen are right for your interiors and go well with your personality, you need to convey your ideas to the bathroom and kitchen design Clarksburg firm of your choice. It is applicable to everyone in Chevy Chase MD who wants to keep their home looking and feeling elegant, functional, modern and stylish. If you are looking for a bathroom design Maryland Company, you always want to get as much value for your money as possible without compromising on the quality of the materials. This is very much possible if you select a brand that is a master in the industry and possesses years of experience. They should be able to provide you with highest quality fittings and solid apparatuses in Kensington MD without fail. Some residents often get skeptical about choosing a particular brand given their relatively higher prices and service charges. They forget that quality doesn’t come cheap. If you are certain that the brand of kitchen and bath remodeling company you’re dealing with in Potomac MD is worthy of your money and time, don’t delay it. 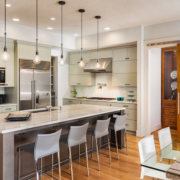 Talking about delaying, do bear in mind that highly skilled and experienced kitchen design Clarksburg specialists will always be in high demand. It hardly matters whether you are looking for a floor to roof type cabinets for your kitchen or a range of lightweight high legged pristine cabinets for your bathroom, everything can be ensured within the time provided you make the choice within time. And don’t forget to ask them for festive discounts. Yes, because every fitting should be within your budget. It is time to make your precious home in Rockville MD even more special.